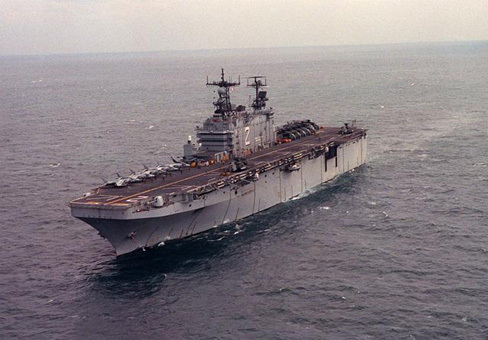 The USS SAIPAN (LHA-2), a Tarawa class amphibious assault ship, was commissioned on 15 OCT 1977. USS SAIPAN served her country for 29 years, 6 months and 10 days, until decommissioned on 25 APR 2007. USS SAIPAN's first major deployment was the August 1980 through February 1981 North Atlantic - Mediterranean - Indian Ocean voyage while the Iranian Hostage Crisis was underway. That set the stage for her career. From her homeport of Norfolk, VA, she under took numerous MEDS, CARIBS and North Atlantic deployments. USS SAIPAN participated in special/contingency operations in Nicaragua, the Cuban Mariel boat lift, Grenada, Liberia, Yugoslavia and Operation Iraqi Freedom. Following her decommissioning in 2007, USS SAIPAN is to be scrapped by International Shipbreaking Ltd., of Brownsville, Texas. AUG 1980 - DEC 1980 First Mediterranean deployment by an LHA. SEP 1983 - DEC 1983 Operation Urgent Fury Grenada W.I. The second Saipan (LHA-2) was laid down on 21 July 1972 by the Ingalls Shipbuilding Division Litton Industries Pascagoula Miss. ; launched on 20 July 1974; sponsored by Mrs. J. William Middendorf II wife of Secretary of the Navy Middendorf. Commissioning of the amphibious assault ship is scheduled to take place in September 1975.